When the guys go hunting....it's Ladies' Night Out! This year on November 15, when the deer get hunted, so do the deals in downtown Harbor Springs. This annual fun and festive event has more than 25 businesses open from 5-9pm with special deals for holiday fun. Jewelry, art and hand blown glass, to boutique clothing and ski wear, to home decor, kitchenware, books, maps, cookies, toys and more! Dinner specials will be offered at local restaurants. Gather - a festive DIY studio: a fun, lively place to get out of the cold and hang out with friends. Serving homemade craft cocktails and My Sister's Bake Shop's tasty bites. Stop by for some drinks, music, and fun! Tom's Mom's Cookies: Gift certificates for the holidays on sale for $15.00 per dozen - a savings of $3.00 per dozen. All T-shirts, coffee mugs, cookie tins and refrigerator magnets 15% off. Kelbel Pharmacy: "Save the Doe!" 25% off Storewide (excluding prescriptions and Young Living Oils); 15% off Young Living Essential Oils. For every $100 sold during the sale, we will donate 10% to the Little Traverse Bay Humane Society. Oil Paintings by Karen Rolfes: Specials throughout the Gallery! Small Batch at the Cupola Room: Fondue Party! Also raffling off desserts throughout the night. Ivy Boutique: 20% off storewide, wine and snacks, and gift card drawings! Irish Boat Shop: Warm up with a Dark & Stormy around the showroom heaters, take aim & shoot for your Ship Store Discount, and don’t forget – Free Parking all night long! Harbor Yoga: Free class ($15 value) with purchase of any class package; homemade craft cocktails and My Sister's Bake Shop's tasty bites. Stop by for some drinks, music, and fun! And no, the evening is not just for the ladies. An occasional male can be spotted! Don't miss this great fall event in downtown Harbor Springs. 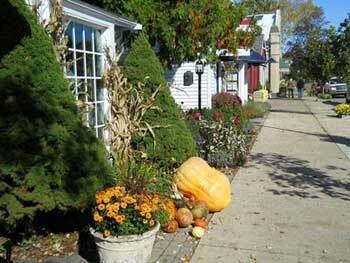 Fall Foliage Color Tour on M-119--Spectacular!